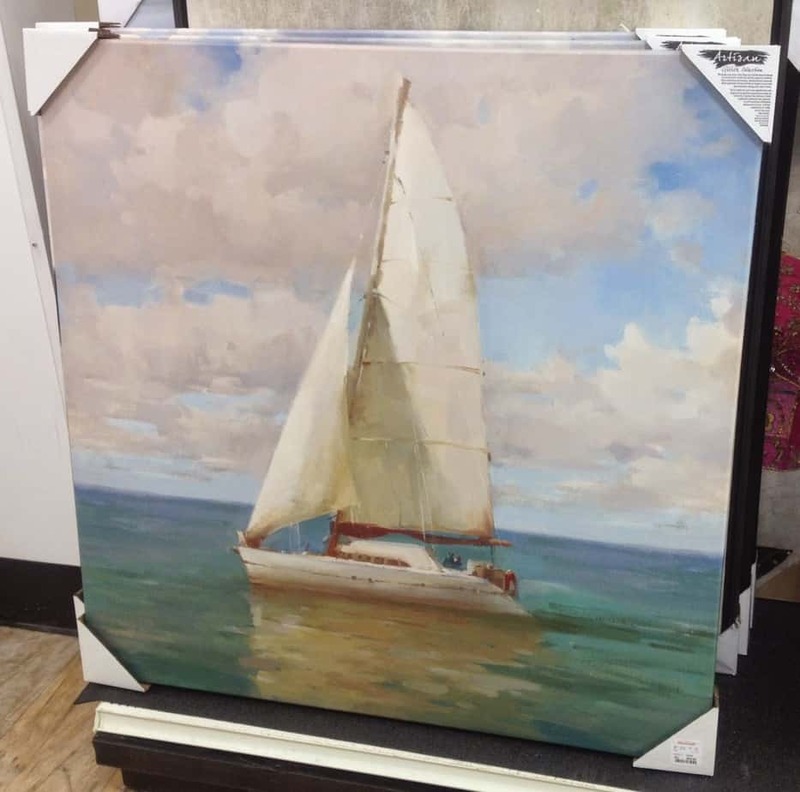 Have you ever seen a really pretty piece of canvas art in one of your favorite home store that you love, except for the weird finish on it? 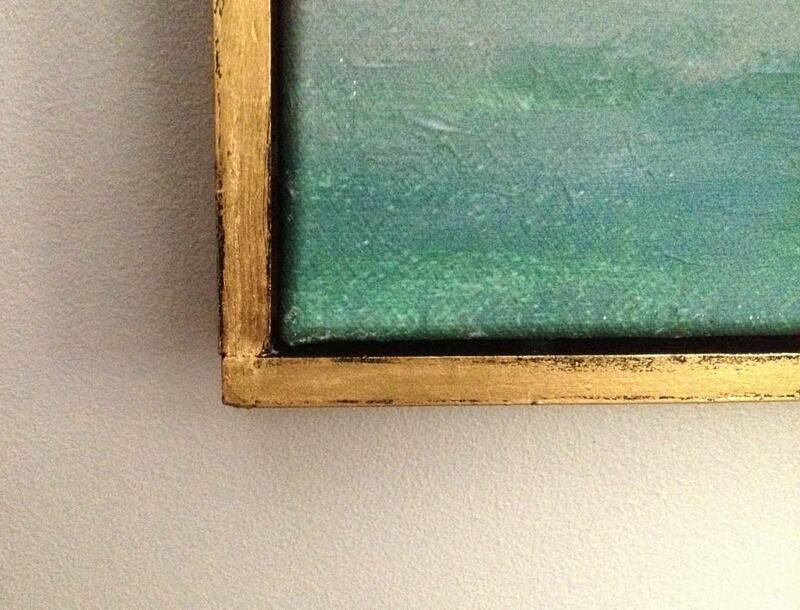 Or you’re undecided on how you feel about the look of the unframed canvas? 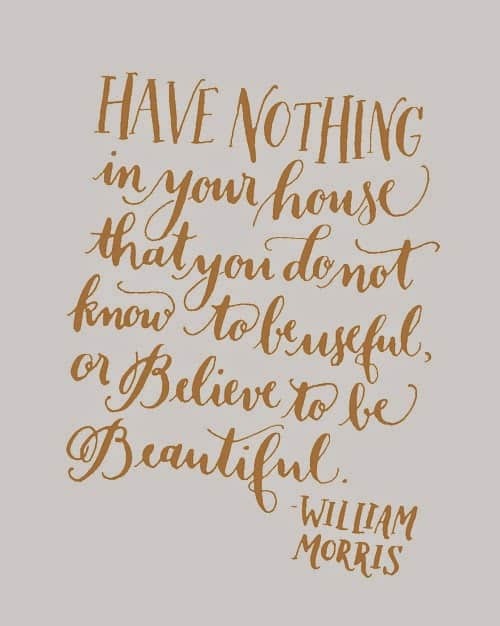 I used to adamantly oppose mass produced art, but I’ve mellowed on this subject over the years because filling a home with original pieces of art or limited edition, signed prints is not exactly feasible for all of us, and finding unusual pieces that fit your budget and speak to your soul at antique and thrift stores can be quite daunting. If we find something beautiful, feel a connection to it and it’s within our budget then who cares if it’s a reproduction from “Marshall’s Boutique” instead of an original piece. I’d like to think that a few “low” pieces will give me or my clients the budget to splurge now and again on a one-of-a-kind or more special pieces. But “low” doesn’t have to mean kitschy or tacky. 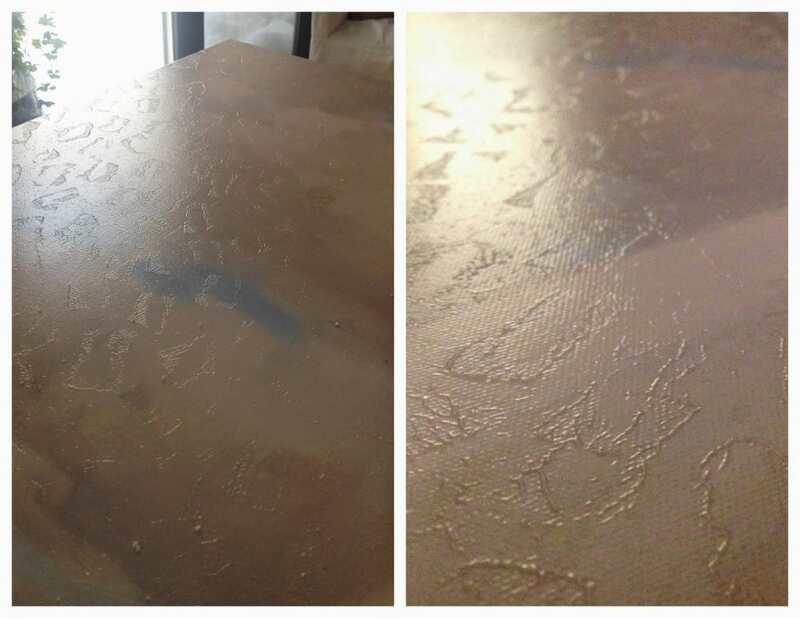 Lately I have seen so many pretty canvas-type pictures, but I just do not get the WEIRD, NOT-FOOLING ANYONE, CHEAP, AWFUL finishes. Take this picture below: there was something about it that I was really drawn to and I thought it would be perfect for clients who have a LOT of blank walls to fill. 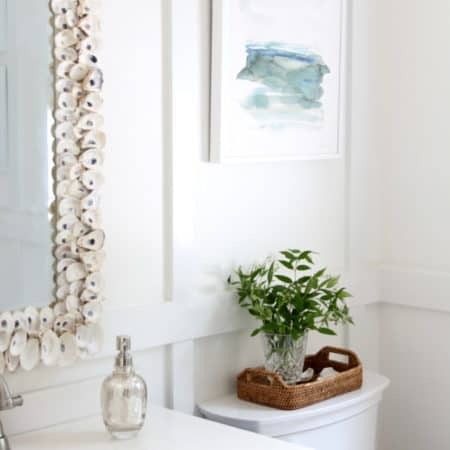 Some of the places that are special to them are by the ocean, the colors would work really well in their home, and it would inexpensively fill up a very large blank space. …but OH – the finish on it vexed me so. This stamping technique on a printed canvas – why why why why why? 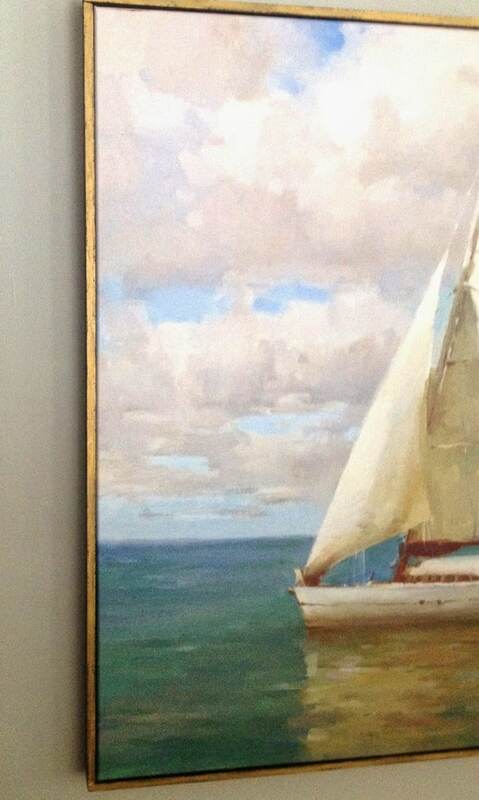 Does it fool anyone into thinking the picture was painted? 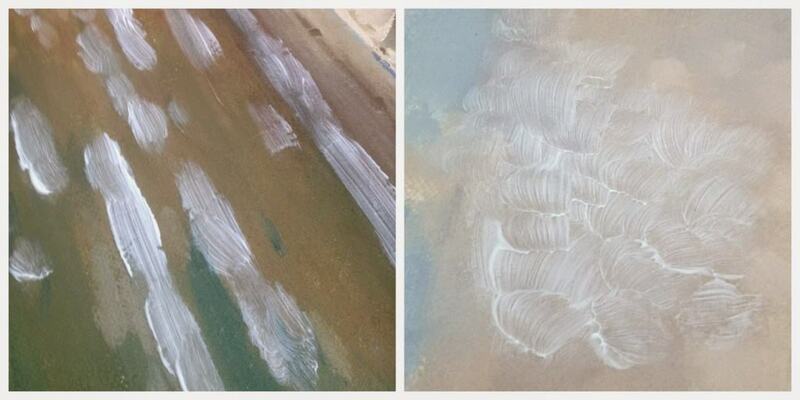 This finish doesn’t enhance the picture at all – it just cheapens the overall affect. I’ve always wanted to try using gel medium to give a paper print a painted affect (like this tutorial from Miss Kopy Kat), and with that in mind I decided to try to use this product to improve the canvas picture. After applying several coats of matte gel medium, the stamped affect is still mildly visible but the end result is so much more subtle, the brushstrokes actually make sense, and the piece feels a bit more classy without the shiny leopard print. It looks about a million times better already! I also made a simple frame for this picture to give it a bit more presence, but before I get to that I’ll tell you quickly how to re-texturize a canvas print. 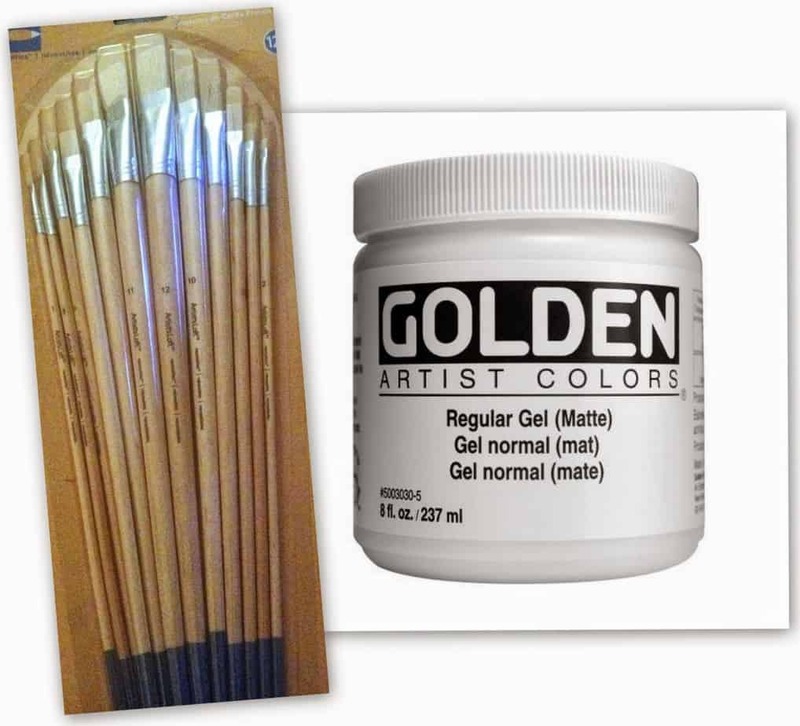 (Both items are widely available at craft/art stores. L// squirt a generous amount of gel medium onto the canvas and cover the entire picture with brushstrokes that follow those of the painting. Allow to dry. 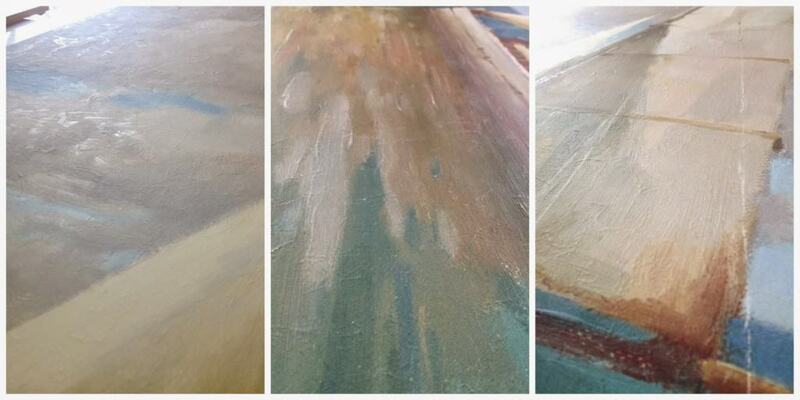 R// build up layers of gel medium in various areas of the picture, allowing the layers to dry in between applications. Building up the layers gives the finished product a much more natural look, gives dimension in the right places and tones down the original finish. I left the picture on my coffee table one Sunday and every few hours I would stop by and add a bit more here and there as the applications dried. 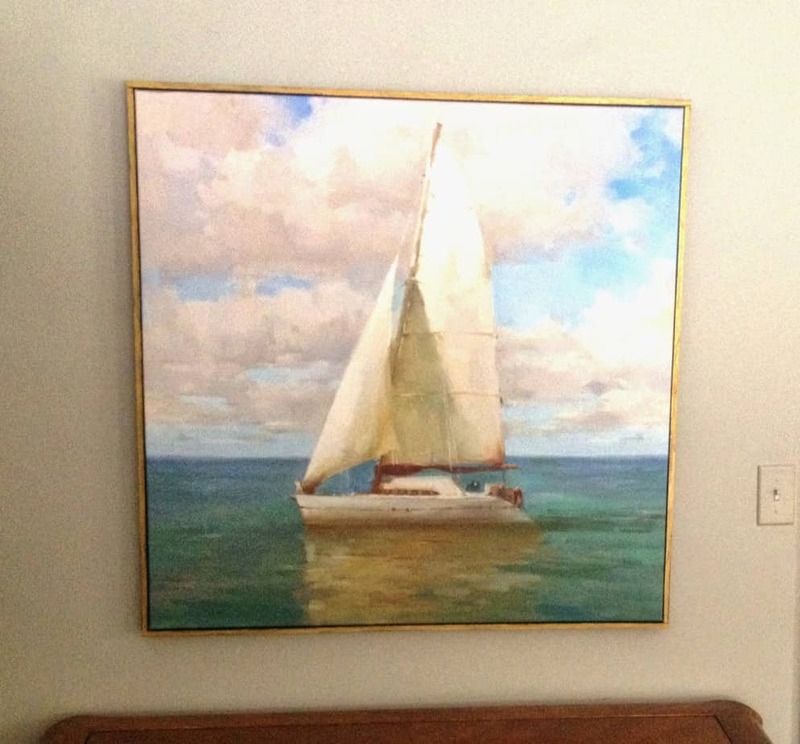 To really finish off a canvas print and give it a more high end look, build a simple frame for it. 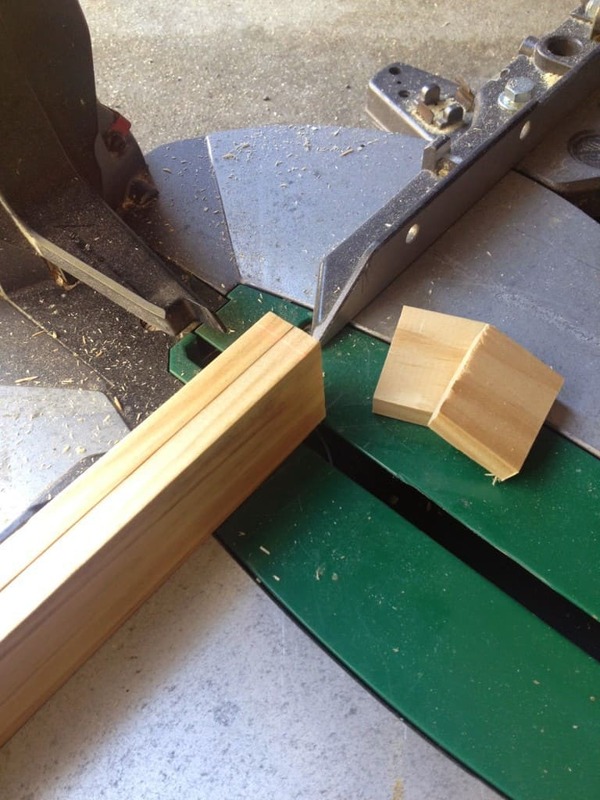 When you are choosing your moulding, make sure to check for warping. Study the pieces to make sure they are straight. Next, cut two pieces to the exact length of the sides. L// Place the left side moulding against the picture. 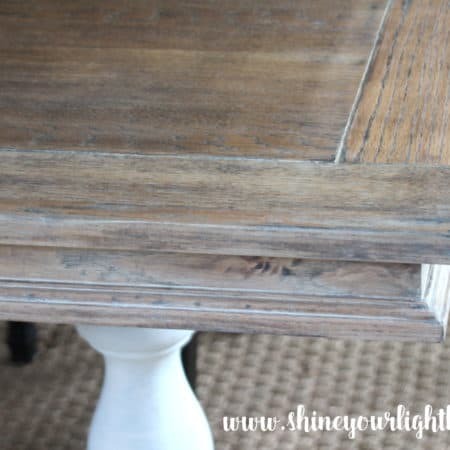 Use painters tape to tightly join this piece with the top and bottom pieces at the corners. R// Place the right side against the canvas and mark the top and bottom pieces so the cut will be exact. If you don’t have a power saw this kind of moulding is a piece of cake to cut with a hand held saw and miter box. 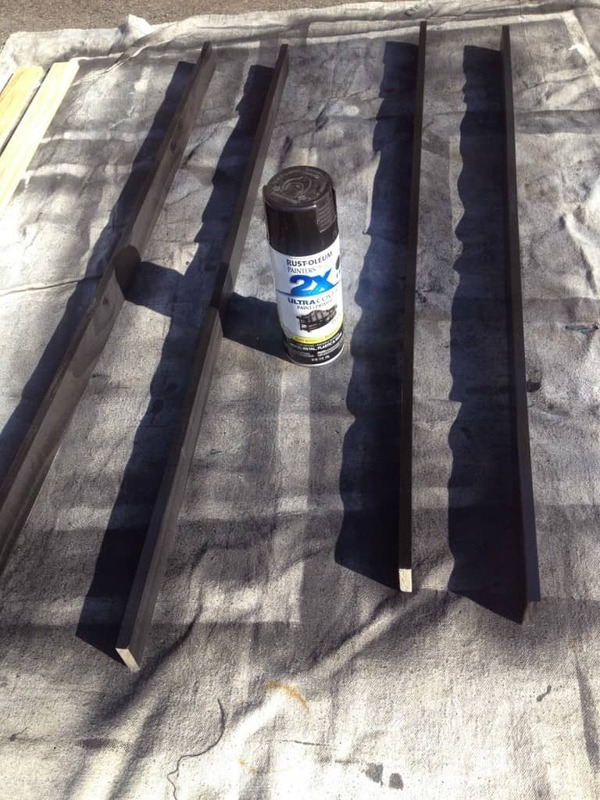 With all your cuts made, take the moulding outside and spray paint to desired color. 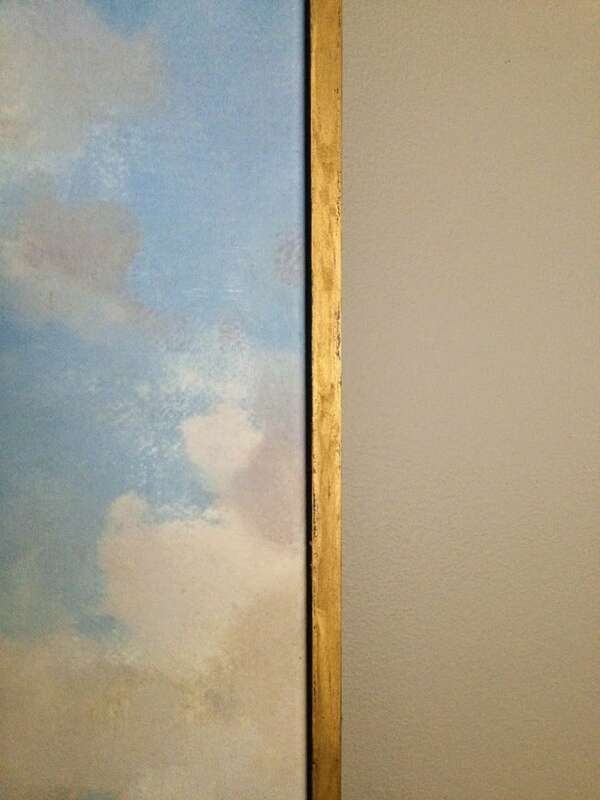 The inside edge of your frame will be visible so make sure to paint it. I wanted the front of my frame to be gold and the outer side and inside edge to be black for a little definition, so I first coated all pieces in black and added the gold later. 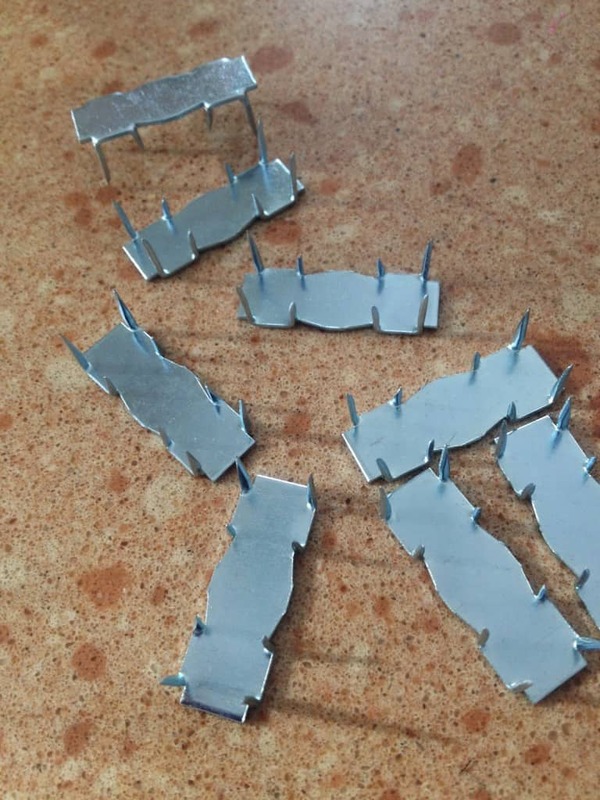 To join the frame around the picture, put a bit a wood glue on the ends of the side pieces and place them flush with the sides of the picture, then fit the top and bottom on. 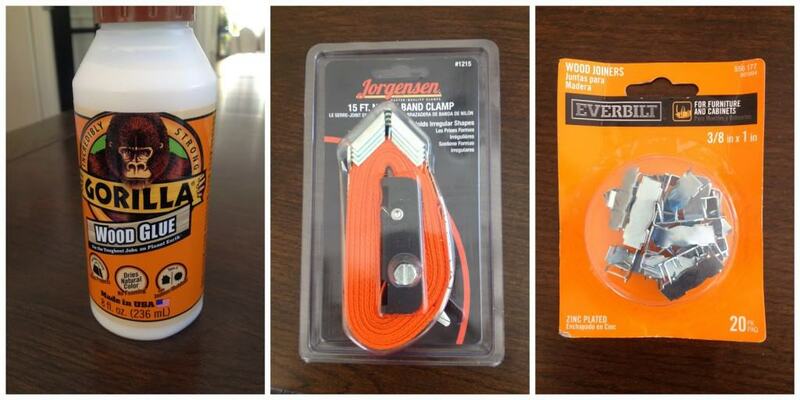 To make the corners join really well, I used a band clamp (which you can find at a hardware store for around $10). 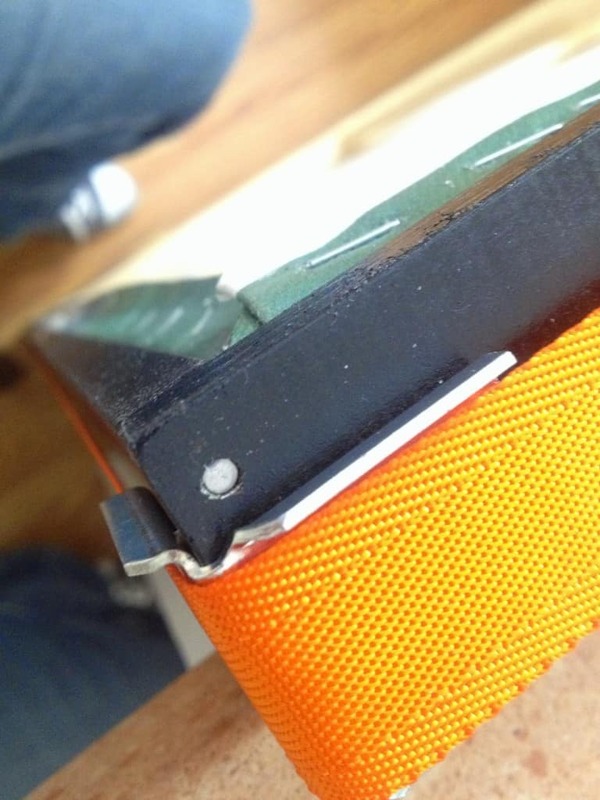 The band clamp comes with corner braces that you place on each corner, then place the band around the frame and tighten with the clamp. Make sure the corner pieces are flush with each other and wipe away any glue that squeezes out. While the glue on the frame is setting, add a few finish nails to the top and bottom corners and set them into the moulding with a nail set. 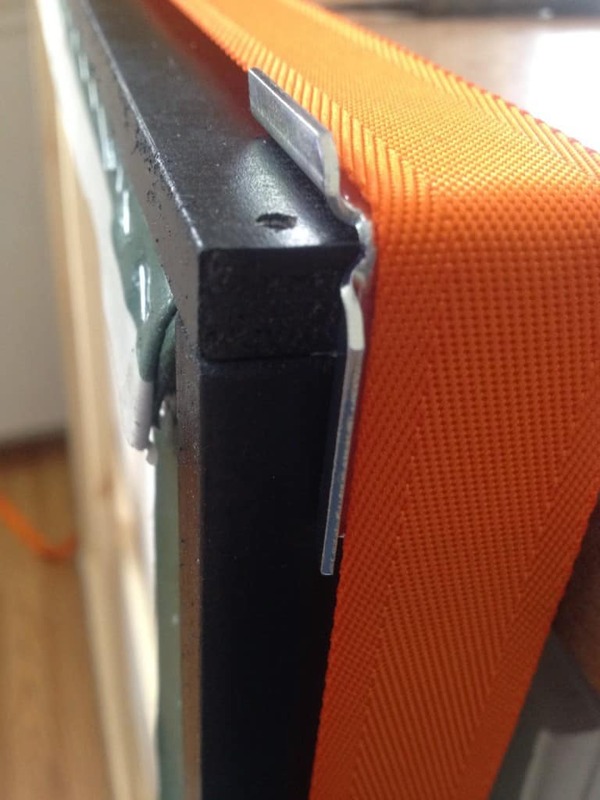 The band clamp keeps everything together perfectly while you do this. Once you have a nail in each corner you can remove the band clamp and add another nail on each side for stability. Fill those nails in and touch up with paint. Next, join together the frame and the stretched canvas. These little buggers are SHARP, beware!! 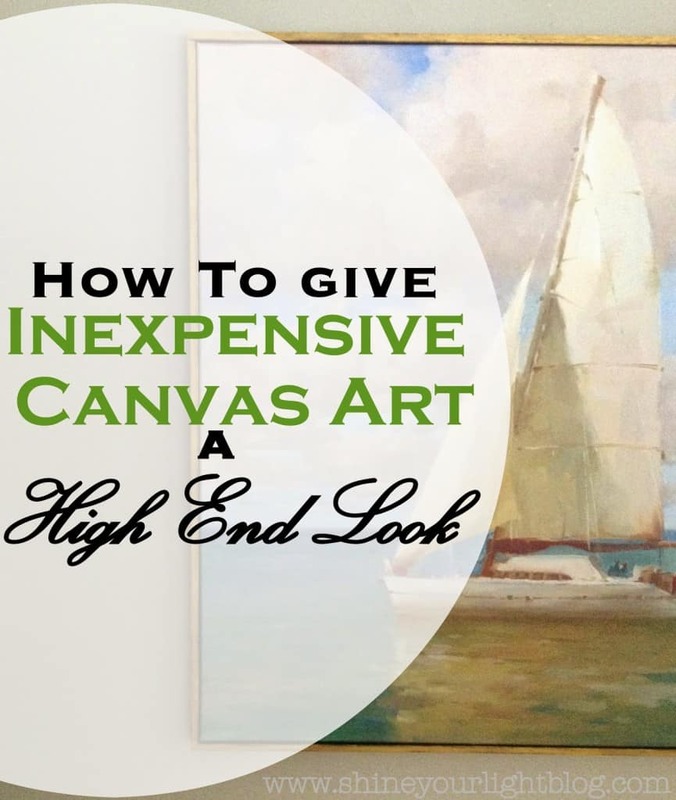 Gently place the framed canvas face down on a carpet or towels. 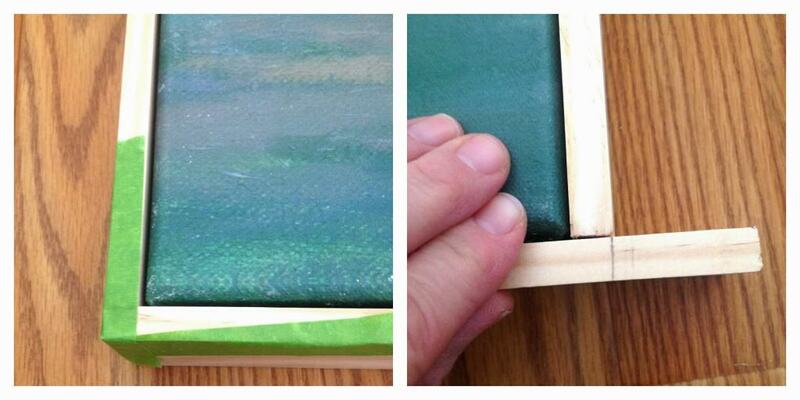 Lay a wood joiner on both the frame and the wood of the stretched canvas and gently tap into both with your hammer. I placed one about an inch from each corner, and then also one in the middle of each side, top and bottom, using 12 total so the two pieces (frame and stretched canvas) were solidly attached to each other. So here we have the re-texturized, framed canvas print…. ….but I think one more final detail will really make this special. My old standby, Rub & Buff. Now I wish I was keeping this piece for myself! It’s a bit of work but really not hard at all to make a store bought mass produced piece of art look a little more high end. 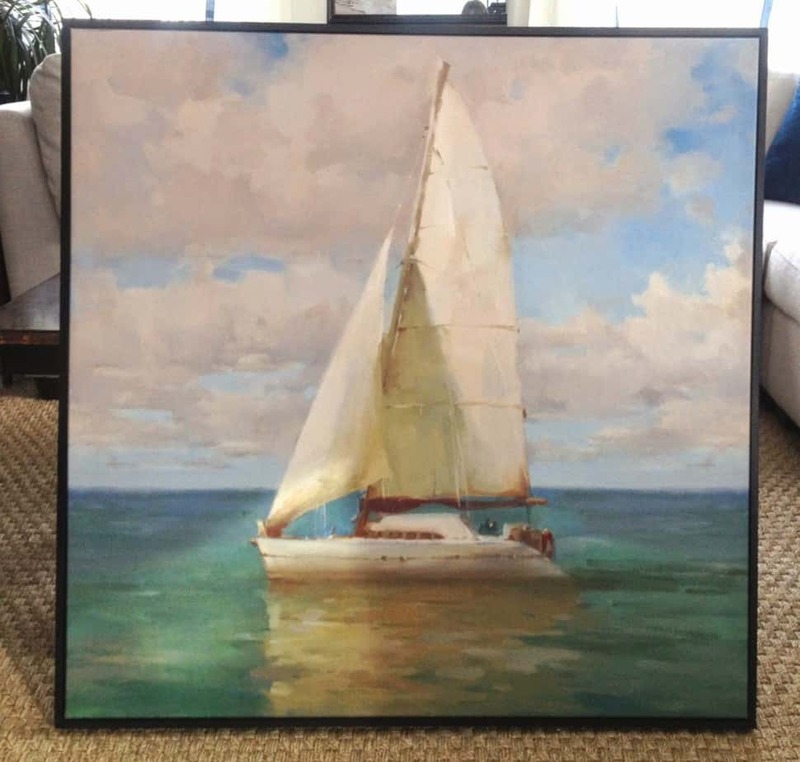 how to re-texturize and frame an inexpensive canvas print and turn it into something special for your home. What do you think? 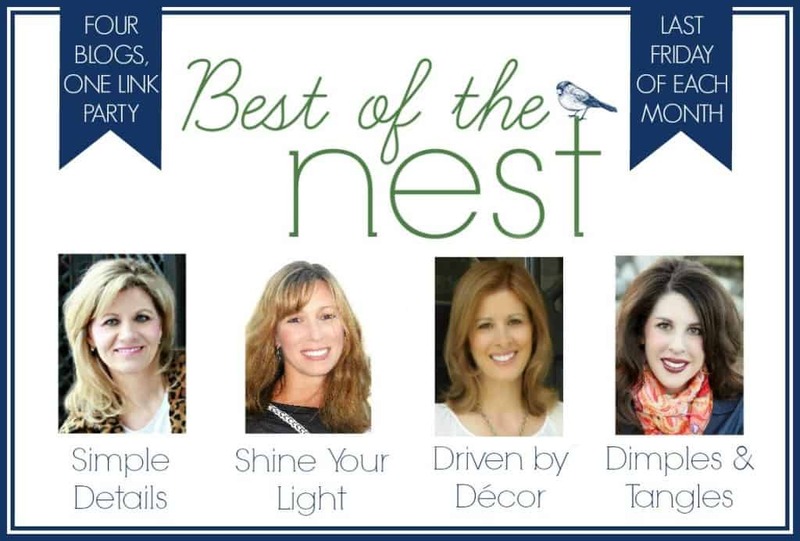 Are you coming to the Best of the Nest party tomorrow? I sure hope so!! We are welcoming another very fun Guest of the Nest so stop by with your favorite project from the month of March and join the party! I’m looking forward to seeing what you’ve been up to! YES to the rub n buff for the final win! It looks absolutely a million times better. So good! You are truly amazing Lisa! WOW!!!!! Can I send you my canvases and do this for me?! 😉 Seriously, you did a fantastic job, from the frame to the finish, it will definitely pass for high-end and even for a real painting! Lisa, how in the world do you figure these things out? Seriously, so incredibly clever and SUCH a huge difference! Putting this on my "must-do" list! I think this is such a great idea! Thanks for the tutorial. And that Rub n Buff is always a nice touch 😉 I will definitely be pinning to use later! first time visiting, will be back! This is an awesome tutorial Lisa! 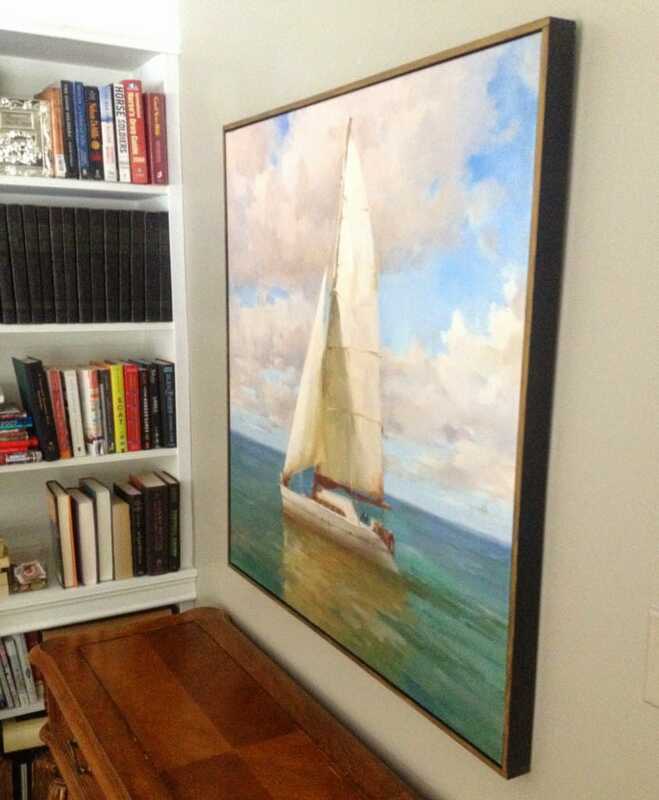 And may I ask where you got the sailboat picture? My husband would love it – once I "fix" it, of course. Thanks! AMAZING!!! And somehow I missed this. Been traveling as you know. Got back at midnight last night. Best of The Nest is great! I love the idea of framing the canvas! You made it look easy, I'll definitely be trying this! Pinning! This is SO awesome Lisa and I love how you did the frame!! Looks great! 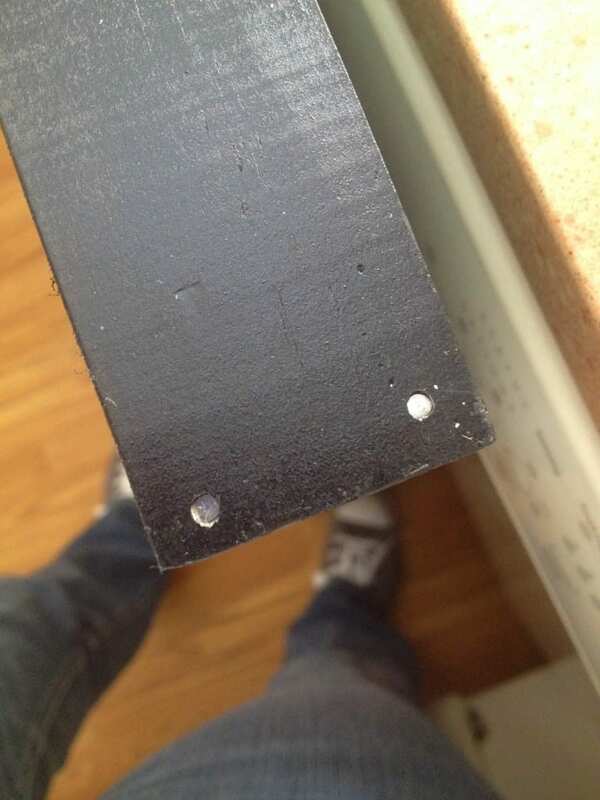 Can you clarify how the wood joiners keep the frame on? Where exactly do you place them? 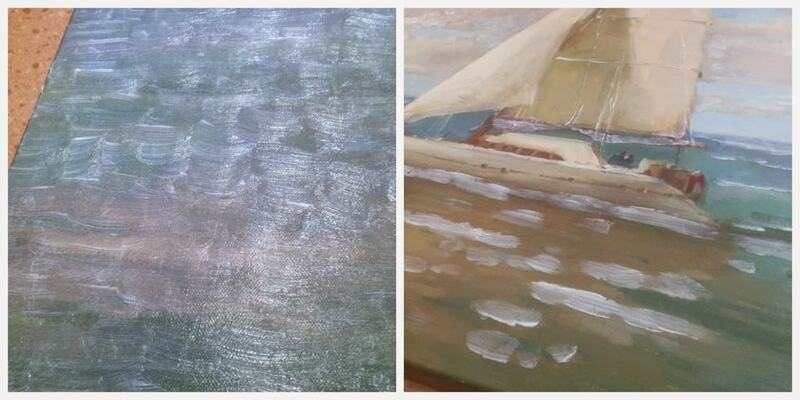 Outer edge of canvas and inner edge of frame? Do you have a picture of this step? This turned out beautiful. I would have maybe thought of the frame, but would have not had a clue about how to fix the finish. So clever! What a difference that makes! It really does look more expensive, especially with the custom frame.